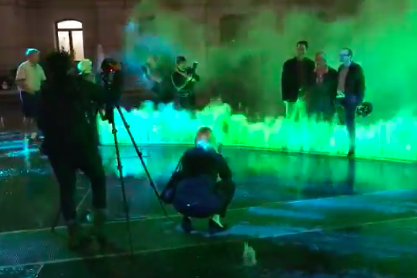 Art installation "Pulse" debuts at Dilworth Park in Center City on September 12, 2018. Nights at Dilworth Park just got a lot more colorful this week as SEPTA's trolleys pass beneath the fountain at City Hall. "Pulse," the long awaited art installation from sculptor Janet Echelman, made its debut Wednesday night in Center City after four years of careful planning. Described by the artist as "a living x-ray of the city's circulatory system," the new installation is designed to dazzle visitors at Dilworth Park and provide real-time information about SEPTA's various Center City lines. Echelman was originally commissioned to conceptualize the project in 2010. A $325,000 grant from the William Penn Foundation back in May provided the necessary funding to complete the first phase representing SEPTA's subway-surface trolley lines. Future phases of the project will introduce blue and orange mist representing the Market-Frankford and Broad Street subways lines. The entire project is meant to function as an homage to Philadelphia's first water pumping station at Centre Square. The atomized dry mist harkens back to the steam that once rose from trains at the Pennsylvania Railroad Station across the street. No timeline has been given for the completion of the next two phases, but with the Eagles winning the Super Bowl and returning to the field to defend it, no one will be worried about any color other than green for a while to come.